Orange County Government employees gathered on Nov. 15, 2018 to celebrate the completion of another successful Heart of Florida United Way (HFUW) fundraising campaign at the County’s annual Victory Celebration at the Renaissance Senior Center in east Orange County. This year, County employees raised a total of $612,205 for the local nonprofit, again surpassing its $500,000 fundraising goal. Since 1939, HFUW has been at the forefront of health and human care services in the Central Florida region. With a goal targeted toward finding a way to prevent problems affecting the community, HFUW is dedicated to focusing on education, income, health and basic needs. This year, event coordinators took inspiration from the excitement demonstrated by employees during the fundraising season, creating an interactive “late-night talk show” for guests complete with music, comedy segments, interviews and a few surprises for the audience. Every year, HFUW gives Orange County employees an opportunity to give back to the community. The Orange County HFUW Executive Steering Committee, departments and constitutional offices organized more than 100 events since the beginning of the fundraising campaign in June 2018, including luncheons, bake sales, golf tournaments and Orange County Fire Rescue’s 343 Hero Challenge. 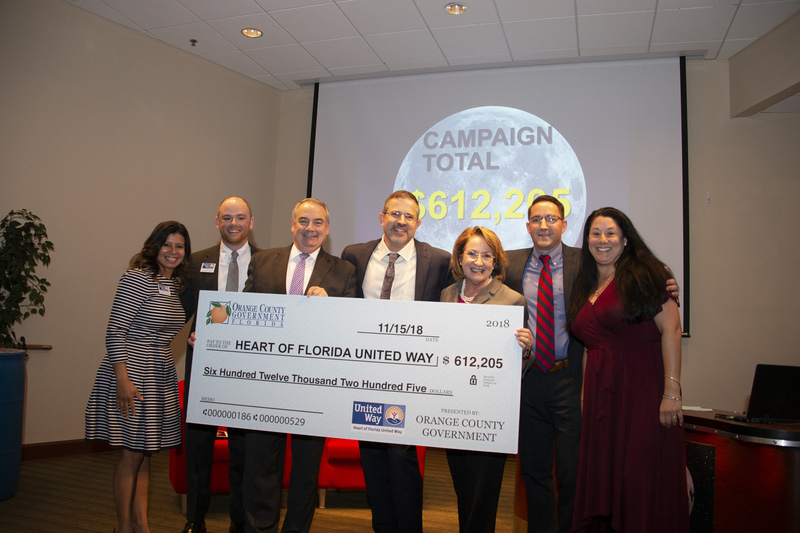 Photo Caption: Orange County Mayor Teresa Jacobs and Heart of Florida United Way (HFUW) President and CEO Jeff Hayward join the Orange County HFUW Executive Steering Committee to celebrate the success of the 2018 HFUW fundraising campaign on Nov. 15, 2018 at the Renaissance Senior Center in east Orange County.